Flip Out Mama: Baby Shower Bash: Fling Bins with GIVEAWAY! Well, covering all the Baby Shower bases wouldn't be complete without, that's right, disposable pop up trash cans! I had the opportunity to review two trash bins from Fling Bins, and I must say I was very impressed! Fling Bins are so easy to use! They arrive packaged flat, and you just take them out of the package, and pop them open to use! They come in a variety of different designs and they all have a 13 gallon capacity. When you are finished, you simply use the easy to use drawstring feature to close them, and you can throw the entire trash can away! 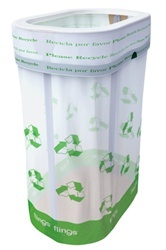 In addition to the trash bins, they also have a recycle bin, that can save up to 60 bottles or cans from the trash! I especially like the recycle bins, I can see myself using these at family functions in the future! 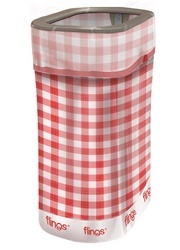 And the BBQ Fling Bin! These were extremely popular at the baby shower, everyone wanted to know where they came from! I think these are an especially good idea for birthday parties, showers, etc.. I am definitely going to start using the recycle bins at cookouts and parties this Summer. These are a great idea and I wish we would start seeing more of them at parks, festivals, fairs, etc... Maybe soon! Thanks so much Fling Bins for giving us the chance to try this awesome product! They are also giving you guys a chance to try them too!! One Lucky Flip Out Mama reader will win two Fling Bins of their choosing! Go here to the Flings Site, and tell me which two Fling Bins you would choose if you were the winner! +2 (PER DAY~) BLOG ABOUT THIS GIVEAWAY, TWEET IT, POST IT ON YOUR FACEBOOK! MAKE SURE TO LEAVE A LINK TO THIS POST! THEN COME BACK HERE AND LEAVE TWO COMMENTS TELLING ME WHERE YOU POSTED. YOU CAN DO THIS ENTRY METHOD ONCE PER DAY, MAKING YOU ELIGIBLE FOR TWO EXTRA ENTRIES PER DAY! Contest will end on 3/20/11 at approx 10 pm EST. Winner will be chosen via random.org and will have 48 hours to respond to email notification or an alternate winner will be chosen. Prize is shipped from the sponsoring company. I am not responsible for prizes that are lost, damaged or otherwise not received! disclosure: I received a sample product in order to conduct this review. Although a sample product was received, all opinions are my own and no monetary compensation was received. 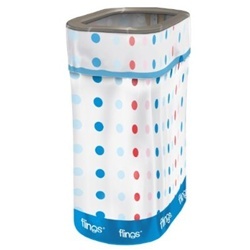 I like the recycle bin and the Womans Day Limited edition polka dots bin! Cute and such a great idea!